Doantrang Marguerite Nguyen knows the importance of welcome. She, her husband and their children no longer were welcome in their homeland after the fall of Saigon. Following a long, painful and uncertain wait lasting two decades, Doantrang Marguerite, then a widowed Vietnamese refugee with four young daughters found welcome in America. 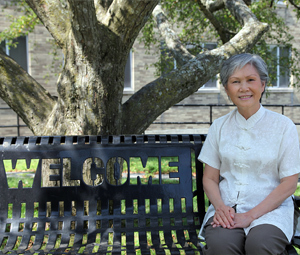 Today, when she isn’t volunteering at a prison or in her parish, spending time with her grandchildren or brushing up her French on the internet, Doantrang Marguerite works as a Job Developer in the Catholic Charities Senior Aide Employment Program, offering welcome and support to low income, unemployed adults over age 55. She helps them identify their strengths, build on past job experiences and stay positive in their search for work. Her kindness, patience and determination are not lost on people who are, at times, without hope. She mentors and encourages them to develop new skills and confidence to re-enter the job market. Doantrang Marguerite, who was previously laid off from professional positions, was encouraged by her daughter to enter our Catholic Charities senior aide program where she found welcome. Willing to learn and eager to improve her English language skills, she advanced to her current position. Her message of welcome to other older adults is based on her own experience. The United States is a land of opportunity. Here you can learn at any age as long as you have faith in yourself and don’t give up.